Making gluten free sweet potato gnocchi is one of my favorite ways to spend a Saturday afternoon. Homemade gnocchi tastes so much better than store bought and its a lot easier to make than you might think. 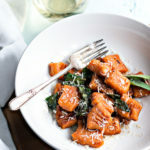 Grab a glass of wine, put on a rom com or your favorite PVR'd tv show, and let's make some sweet potato gnocchi. First you need to cook your sweet potatoes. Prick them a couple times with a fork and bake them at 400 degrees until they are soft. The time will vary depending on the size of your sweet potatoes, but roughly 45 mins to 60 mins for smaller to medium ones. Slice open your sweet potatoes and let them cool slightly, then put them through a potato ricer or mash them really well so there are no lumps. Make a well with your sweet potatoes, add the egg to the well and beat it a bit with a fork. Add 3/4 of the flour and begin to mix it into the sweet potatoes with the fork and keep adding a little more flour as needed until the mixture becomes a soft dough. You will likely need to mix it with your hands and use all of the flour and possibly a bit more. Try to only mix as much as needed and no more. Bring the dough together to form a ball. On a flat and floured surface, roll each piece of dough into a ball in your hand and then start rubbing your hands together to make a 'snake' out of the dough. Put the dough 'snake' on the surface and keep rolling your hands back and forth over it to make it long and evenly round until its about an inch thick. Cut the 'snake' into 1 inch pieces. Press a fork into each one to make an imprint if desired. Boil a pot of water. Add the gnocchi (frozen or fresh) to the boiling water and give it a little stir. Cook until the gnocchi starts to float. Drain. While the gnocchi is boiling, melt the butter in a frying pan over medium heat. Let it start bubbling and browning, but be careful not to burn it. It should brown slowly turning a caramel color. Add the gnocchi to the frying pan. It will start to sizzle! Keep frying and turning till they are brown and crispy on all sides. Add the sage and cook for 30 seconds or so as the sage will get crispy quick. Pour onto a plate and drizzle the extra butter on top. Grate or sprinkle the Parmesan over it all and sprinkle with salt and pepper. Eat! Add the butter into a frying pan on low to medium low heat and when its melted, add the gnocchi right away, shake the pan and toss the gnocchi in the butter. Put a lid on and cook for about 2 mins. Take the lid off, toss the gnocchi again and put the lid back on for 2 mins. Remove the lid, turn up the heat to medium and let the gnocchi fry till browned on all sides. Add the sage and cook for 30 seconds or so as the sage will get crispy quick.